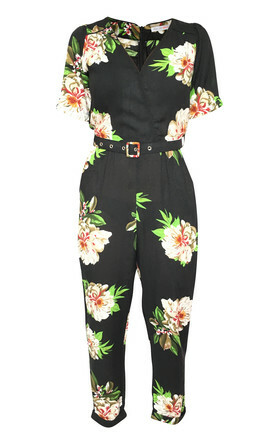 Pretty fitted full length jumpsuit with a self belt at the waist. When you're tired of dresses and only a jumpsuit will do... this is your Spring going out staple! Fabulously fitted with a faux cross-over front, epaulette detail and cool waist detail this jumpsuit ticks all the trend boxes for this season. Wear with flat boots and a biker for daytime chic or wear with killer heels and smokey eyes for evening full on glamour!